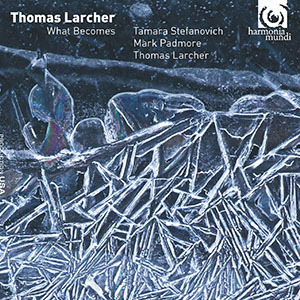 Despite his rather unlovely and preposterous statements regarding the state of the art of modern piano playing, Thomas Larcher’s music is, nevertheless, always curious and in the case of What Becomes rather startling. As a composer he is neither able to get away from the piano’s natural sound, by hammering and plucking the strings. But what he succeeds in doing is drawing attention to the fact that the piano can be manipulated to produce sounds that might be percussive and almost like tuned drums, at times. Or he might coax the piano into sounding like a lyre or at times like a lute. Ironically, all of the sounds are from instruments rarely used today, but coming from the piano they do sound unusual. Much of this has to do with the outstanding technique displayed by Tamara Stefanovich, who plays the first 21 pieces. Mr. Larcher is no slouch either and his performance is interesting too, for it lives up to its promise of being novel without being as outrageous as the statements that he makes regarding the state of the instrument. Perhaps he intended to shock and there is nothing wrong with ensuring that a few octogenarians reach for their smelling salts upon reading Mr. Larcher’s opening remarks in the liner notes to this album. The first two pieces of the repertory are exquisite; masterpieces of tempi. 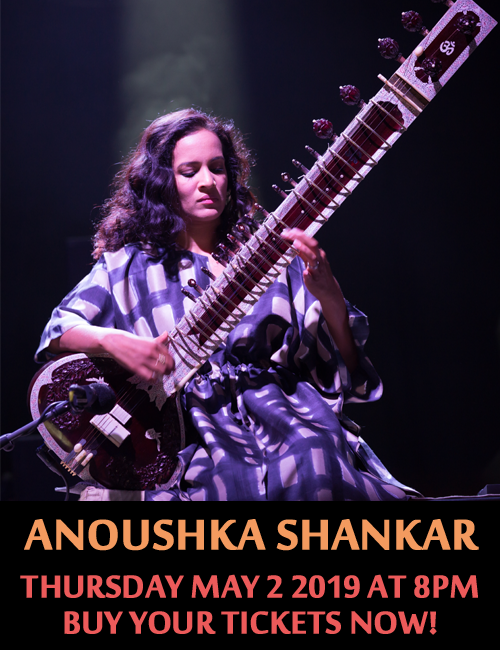 Created not only to exist in almost suspended animation, it would seem their music unfurls on the spur of the moment. Ms. Stefanovich understands perfectly the importance of time and space and in fact creates a kind of portal through which the music passes in and out of as if masterminded by a sort of Aldous Huxley-like opening and closing of the doors of perception. The pianist’s touch is impeccable and she seems to caress the keyboard when necessary as well as pressurise it into a fit of rage when the tempo suggested demands it. The “Poems” could well be arias of a sort, or Lieder without the words. In the toss-up a programmatic cycle is created to seduce the mind and the heart with their beauty. The seven programmatic pieces forming the central part of the repertory are also wonderfully rendered by Ms. Stefanovich, who might easily outshine the compositions themselves, were she not so diffident in her playing. Mr. Larcher’s “Padmore Cycle” created for the rich and four dimensional tenor of Mark Padmore are just as beautiful as “What Becomes.” But here is further evidence that Mr. Larcher may have set out to merely shock his audience and listeners by his statements about the piano. However, the manic power of the cycle is breathtakingly beautiful and will be remembered for its elasticity, gracefulness and soaring majesty for a long time to come. The cycle is based on the poems of Hans Aschenwald and Alois Hotschnig. But it is Mr. Padmore who turns in a magical spectral performance almost as if his voice were being projected from another invisible dimension. Mr. Larcher himself turns in a sterling performance and the spectral nature of his playing is only matched by Mark Padmore’s. 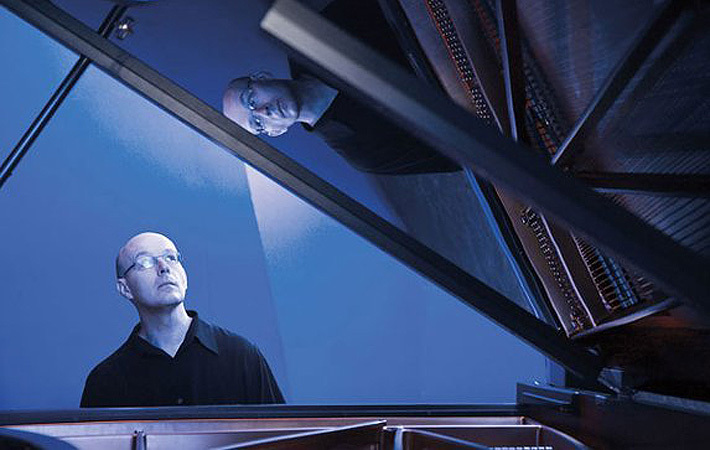 And suddenly Thomas Larcher’s opening remarks about the state of the piano are long forgotten, both because of his stunning and rather traditional turn as well as by the duet between himself and Mr. Padmore.